If you are just beginning your adventure into modeling trains and railroads, you may wish to check out the Overview page. In addition, there are a few basic things to know that will help you in your decision-making when it comes to model railroad planning and design. The first thing you should do is decide on a theme for your railroad. ~What is your railroad's purpose? Where are your trains going to and coming from and why? Are they going to carry passengers from one town to another? Will they mostly carry coal to towns or local ports, timber to lumber yards, or farm goods to markets, etc? ~What is the setting: the location and era? Where and during what time period will your trains be operating? These can be either specific or general. If you like steam trains you will want to model the era before 1955. Diesels became popular in the late 1940's and beyond. The period between 1945 and 1955, the transition era, saw both steam and diesel running the rails. The location you want to model would help you decide which particular railroads - like Union Pacific or Norfolk Southern, etc.- you want running through your layout. ~What kind of model trains or equipment do you want to run on your layout? Again the place and the time you want to model may help you decide. Or it could be the other way around. You may really want to model the Lehigh Valley Railroad because you like the colors, for example, in which case the general location and time frame would already be known. ~What type of service will your model railroad provide and to whom? What industries and/or towns will your trains be carrying goods (or people) to and from? Do you like coal-hauling, logging, farming, oil industries, passenger service? These are very important decisions that will lay the foundation for how you will design and build your layout. For more info on this subject, see the "Design" page. You then need to decide on what scale to use. (Scale refers to the ratio between the measurement of a model compared to that of the prototype.) In other words what size trains do you want to run? a) How much space you have, b)how much money you can comfortably devote to the hobby, c) whether you like a lot of scenery vs. more emphasis on the trains, d) whether you would prefer long running trains or shorter trains, and e) whether you have the patience, the visual acuity, and finger dexterity to deal with very tiny engines on tiny tracks. Incidentally, the words scale and gauge are often confused. Scale refers to the ratio between the measurement of a model compared to that of the prototype. Gauge is the term used to describe the distance between the 2 rails of track - usually 4 ft 8-1/2in ("standard gauge") in the prototype. "Narrow gauge" is a term used for rails that are closer together than standard gauge - usually around 3 to 3 1/2 ft.
To get more detailed information to help you decide on what scale to use, go to the "Scales" page. The third thing to decide in your model railroading adventure is how you will show off and operate your trains. Are you building this railroad for your own enjoyment? Will you have friends helping you and participating in the operation of the railroad when it is completed? Is it mostly for your children or grandchildren to enjoy? Will it become part of a larger club layout? Do you want to build a small scene that you could sell at a craft show or on eBay? There will most likely be some limiting factors that may enter into this decision also, such as space, time and monetary considerations. For more on this subject and some examples, check out the "Displays" page. So you can see there are many things to consider when deciding what kind of railroad you want and how you want to show it or operate it. However, don't get so hung up on the decision-making process that it prevents you from moving forward. Like they say in the commercial, once you have considered the options, "just do it". Okay, now that you have considered the location, the era, the scale and what type of display you want to model, you're ready for the next step. Go to your local hobby shop or click on the link and pick out your train set . This will get you started. Then, after you have set that up and had some fun with it, read more on this site about how to expand your set into a realistic track plan, construct benchwork for it and enhance it with mountains and scenery, light up your buildings and passenger cars. Now you're talking! You'll never be the same again! Red Earth Railway - Funny, entertaining and informative DVD video tutorials on how to build a model railroad. Basic MR: Getting Started in the Hobby by Kent J. Johnson. 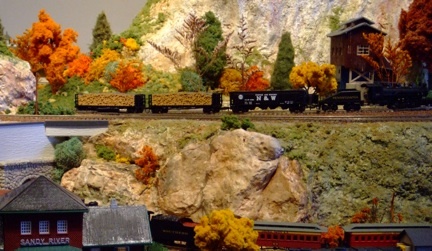 If you would like to introduce your small children to the fun of making crafts, models and dioramas, you may wish to visit the webpage at Homeschool-Activities.com for some ideas that may lead them into model railroading later. One of my visitors asked me recently, "How do I get started building an HO layout with two mainlines - one passenger and one freight?" I would start with 2 regular HO train sets - one freight and one passenger. I like Kato tracks the best but Bachmann is okay too. They are easy to put together and they stay together with less risk of derailments. For power, I would just start with regular DC transformers that come inside most regular commercial train sets. You can always upgrade to better transformers later and may want to upgrade to DCC later which is not all that difficult. Now, use some paper and pencil and draw out a sketch of the type of layout you wish to create - put down where do you want to put roads, buildings, mountains, rivers, etc. Make it interesting but not too big and not too complicated. The more complicated it is, the more difficult it will be for you to manage your trains and to troubleshoot problems, not to mention the fact that large detailed layouts take forever to build. For your benchwork, I like the Woodland Scenics modular benchwork that are easy to put together and easy to add on to later if you wish. Get some foam sheets from your local construction store and ask them to cut the sheets to fit the top of your benchwork. While you’re there ask them to cut plywood sheets for you in the same dimensions. Then put the plywood sheets down on top of the benchwork and lay the foam sheets on top. Now you’re ready to start laying the track according to your plan that you’ve sketched out. Once you’ve got the track where you want it, check it out by running your trains back and forth on those tracks to be sure there are no problems. Make sure that your track curves are far enough apart so that when the trains are running beside each other they don’t crash or knock each other over. This is especially important with passenger trains because the cars are longer and the middle of the cars can sideswipe your freight cars on the other track. Make sure you’re wiring to the tracks is all foolproof and that the trains run perfectly in both directions. Now is the time to troubleshoot because it’s much more difficult later to tear up and replace track that wasn’t put down properly. If your plan involves ramps and bridges, you want to create those now and make sure they are secure and foolproof as far as running trans is concerned. Then glue all the tracks, ramps and bridges in place. Be very careful not to get any glue on the rails and especially not on any of the switches (turnouts). After it all dries, run the trains again and make sure there are no problems. Then you can start building your scenery which is what really defines your layout. For details on all this, check out the first 8 or 9 categories on the building-your-model-railroad.com website. As you get more advanced with your layout, you can add railroad signals, automated starts and stops and lot of other fun things, but get the basic layout done first and always make sure your trains can run flawlessly every time you add or change something. You never know when friends are going to come by and want to see your trains. Return from The "Basics of Model Railroading" to the "Homepage"